Indian army chiefs rarely make policy statements. Thus, on the rare occasion when they do choose to partake in diplomatic posturing, it is taken very seriously. This is exactly why the DG ISPR and the Defence Minister took very stern notice of General Bipin Rawat’s press statement on January 12th, where he said that his force was ready to call out Pakistan’s “nuclear bluff” and carry out cross-border operations if need be. It must be fun to engage in high-level brinkmanship. Otherwise, it must get tiring to have so much authority and yet not be able to do anything with it. How else can one explain such a callous statement by a four-star general, who understands the consequences of a nuclear war in the subcontinent all too well? With all due respect General, nothing could be further from the truth. Nuclear weapons have proven to be weapons of deterrence and have proven to avert war time and time again. The only reason the United States and the USSR did not go to war was because they both had nuclear weapons which could destroy the world many times over and ‘mutually assured destruction’ was a very real concept, not just textbook theory. Even at the height of the Cold War, during the Cuban missile crisis, the superpower adversaries feared locking swords. John F Kennedy and Nikita Khrushchev engaged in high-level brinkmanship, but neither seriously considered pressing the nuclear button. Both India and Pakistan became nuclear powers after India’s five nuclear detonations in Pokhran, Rajisthan, and Pakistan’s six nuclear detonations in response to it in Chaghai, Balochistan, in May 1998. It was only because of these nuclear tests that the Kargil episode did not escalate to a full-blown war between the two nations. Another event which could have led to a war between the two subcontinent giants was the terrorist attack on the Indian Parliament in 2001. The resulting 2001-02 military standoff between India and Pakistan was the largest mobilisation of forces since World War II. As in Kargil, while the international community played its part in de-escalating the situation, there was nothing stopping the Indian forces from attempting to cross the international border were it not for Pakistan’s nuclear deterrent. Similarly, the 2008 Indo-Pakistan standoff after the Mumbai attacks did not result in an expected war. Again, Pakistan’s nuclear deterrent and refusal to adopt the “First No-Use” policy came to its rescue. Forget 2008, even after the 2016 Uri attack, despite claims of a “surgical strike”, India couldn’t do much other than raise a lot of hue and cry over the attacks. The trend over here is that after each one of these attacks, India has rightly or wrongly blamed Pakistan. After the 2001-02 military standoff, the Indian Army realised that it took more than three weeks for its forces to mobilise, giving the Pakistani Army enough time to amass defensive deployments. Cold start was perceived as a plan to make inroads into Pakistani territory within 48 hours of any major provocation. In response to this, the Pakistani establishment decided that in the face of Indian incursions into Pakistan, it would cede its territory, but also deploy and use tactical nuclear weapons such as Hatf I and Nasr Hatf IX within its territory to thwart the numerically superior Indian forces. Thank God, this scenario remains in the emblem of war games and has not been put to actual test. Strange as it might seem that Pakistan would be willing to use nuclear weapons within the country, it is a strategy that works because war is a psychological game more than anything else. You don’t provoke a mad dog because the consequences are unpredictable. When the mad dog is a military state hell-bent on survival, the consequences are not only unpredictable, but also catastrophic. A nuclear confrontation would not only cripple the subcontinent but would be disastrous for the whole world. If nuclear weapons are directed at any of the major Indian or Pakistani cities, 20 million people would vanish in thin air from the direct effects of the weapons. This is half the number of people killed in all six years of World War II. The resulting firestorms would make cities like Delhi, Lahore, Karachi and Mumbai skeletons of their original selves. About one to five million tons of smoke would rise 50 kilometres above cloud level. The resulting stratospheric smoke layer would block sunlight from reaching the Earth’s surface. Skies all over the world would turn from blue to grey. Temperatures would drop drastically and we might see many years with no summer anywhere in the world. There would be food shortages and hundreds of millions of people would starve to death. This nuclear darkness is not a very likely scenario, however. We all know that the Indian army chief’s statement is mere posturing. The Indian defence establishment has many a time raised the spectre of a Pakistani invasion, but the idea has never materialised, because the cost benefit analysis does not hold out. India has much to gain from avoiding an incursion into Pakistani territory and much to lose if it doesn’t. 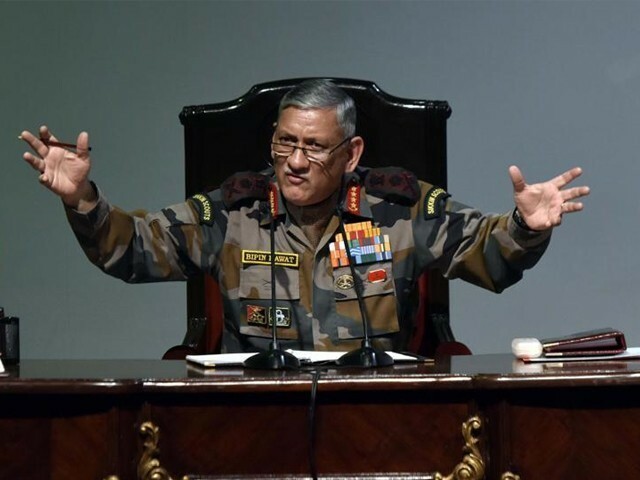 India’s economy in fact would thank the Army Chief General Rawat if he doesn’t ponder over brazen war manoeuvre in his sleep. General Rawat obviously knows all this, so there must be a reason why he is engaging in war posturing. It can be a play for dominance vis a vis Pakistan, but he is also sending a very specific message to Pakistan. Back in September, after the 70-day Dokalam standoff with China, he made a statement that India “cannot rule out the possibility of a two-front war with China and Pakistan”. India and China have always had border disputes, and the Indian military has assessed that the People’s Liberation Army would continue to make small transgressions on the 4,057-kilometre Line of Actual Control (LAC). There is a feeling within Indian military quarters that in the future, the all-weather friends – China and Pakistan – may act in tandem against India, with Pakistan taking advantage of the situation on India’s northern border. Thus, to diffuse the likelihood of this eventuality, the General has put up a brave face against its two foes, warning that India would not shy away from engaging in all-out war, despite Pakistan’s nuclear deterrence. Thus, for the sake of our future generations, the esteemed General should abandon all plans of a two-pronged war. See, the general is close to retiring. He needs to find a cushy, well paying job with good benefits, to cover his current living style. With statements like these, one of the extremist Hindutva political parties will snap him up as a mouthpiece. They may make him run for political office, even run for Congress. There. Simple. With elections just around the corner for India [where you win elections by spouting poisonous vitriol about Pakland] the general is all set for his next job. Indian Elites? Huh? There is such a thing as elites in Bharat?